The LCCL domain has been named after the best characterised proteins that were found to contain it, namely Limulus factor C, Coch-5b2 and Lgl1. It is an about 100 amino acids domain whose C-terminal part contains a highly conserved histidine in a conserved motif YxxxSxxCxAAVHxGVI. The LCCL module is thought to be an autonomously folding domain that has been used for the construction of various modular proteins through exon-shuffling. It has been found in various metazoan proteins in association with complement B-type domains, C-type lectin domains, von Willebrand type A domains, CUB domains, discoidin lectin domains or CAP domains. It has been proposed that the LCCL domain could be involved in lipopolysaccharide (LPS) binding [(PUBMED:10971586), (PUBMED:9806553)]. Secondary structure prediction suggests that the LCCL domain contains six beta strands and two alpha helices [(PUBMED:10971586)]. 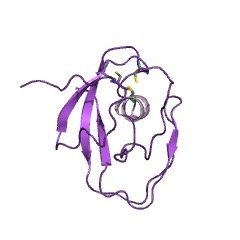 Some proteins known to contain a LCCL domain include Limulus factor C, a LPS endotoxin-sensitive trypsin type serine protease which serves to protect the organism from bacterial infection; vertebrate cochlear protein cochlin or coch-5b2 (Cochlin is probably a secreted protein, mutations affecting the LCCL domain of coch-5b2 cause the deafness disorder DFNA9 in humans); and mammalian late gestation lung protein Lgl1, contains two tandem copies of the LCCL domain [(PUBMED:10362728)]. There are 2753 LCCL domains in 1821 proteins in SMART's nrdb database. Taxonomic distribution of proteins containing LCCL domain. This tree includes only several representative species. The complete taxonomic breakdown of all proteins with LCCL domain is also avaliable. Click on the protein counts, or double click on taxonomic names to display all proteins containing LCCL domain in the selected taxonomic class. NMR structure of the LCCL domain and implications for DFNA9 deafnessdisorder. The LCCL domain is a recently discovered, conserved protein module namedafter its presence in Limulus factor C, cochlear protein Coch-5b2 and lategestation lung protein Lgl1. The LCCL domain plays a key role in theautosomal dominant human deafness disorder DFNA9. Here we report thenuclear magnetic resonance (NMR) structure of the LCCL domain from humanCoch-5b2, where dominant mutations leading to DFNA9 deafness disorder havebeen identified. The fold is novel. Four of the five known DFNA9 mutationsare shown to involve at least partially solvent-exposed residues. Exceptfor the Trp91Arg mutant, expression of these four LCCL mutants resulted inmisfolded proteins. These results suggest that Trp91 participates in theinteraction with a binding partner. The unexpected sensitivity of the foldwith respect to mutations of solvent-accessible residues might beattributed to interference with the folding pathway of thisdisulfide-containing domain.